The New Carrington Centre in Eccleston, Chorley was officially opened on Friday 11th April in view of around 200 of the local community; and Grand National winning horses Hedgehunter and Ballabriggs were on site to assist in the proceedings. 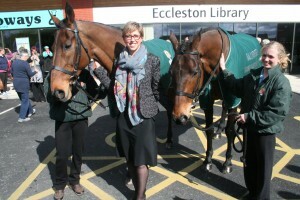 Hedgehunter won the National race in 2005; whilst Ballabriggs won in 2011. A & S Holdings has acquired the New Carrington Centre from Northern Trust; but the scheme will still be managed by Northern Trust’s in-house management company Whittle Jones Chartered Surveyors. To celebrate completion of the works on site Sally Hardie from A & S Holdings formally unveiled a plaque at the opening event, which was held in Cafe Manna and was attended by occupiers at the new development. 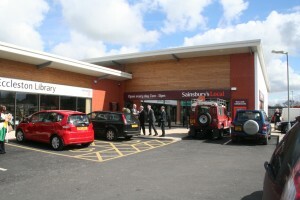 The 13,000 sq ft new retail parade includes a 4,000 sq ft Sainbury’s convenience store, along with 8 shops including the post office, pharmacy and library.